Electric cooker, Rayburn cooker, microwave, fridge/freezer, dishwasher, kettle, toaster, cafetiere, cutlery, glass, china, utensils, pots and pans, serving dishing, tea towels. Wood burning stove and storage and panel heaters. "I enjoyed this 3 night stay very much, the cottage was idyllic. I am an avid bird lover so really enjoyed sitting at the kitchen table watching the birds on the feeders, think we counted 17 different species over the 3 days. We were very lucky with the weather and enjoyed walking around the area attached to the cottage. All in all a great energy boost, will be back at some point." Feb 2019 from UpFront Reviews. 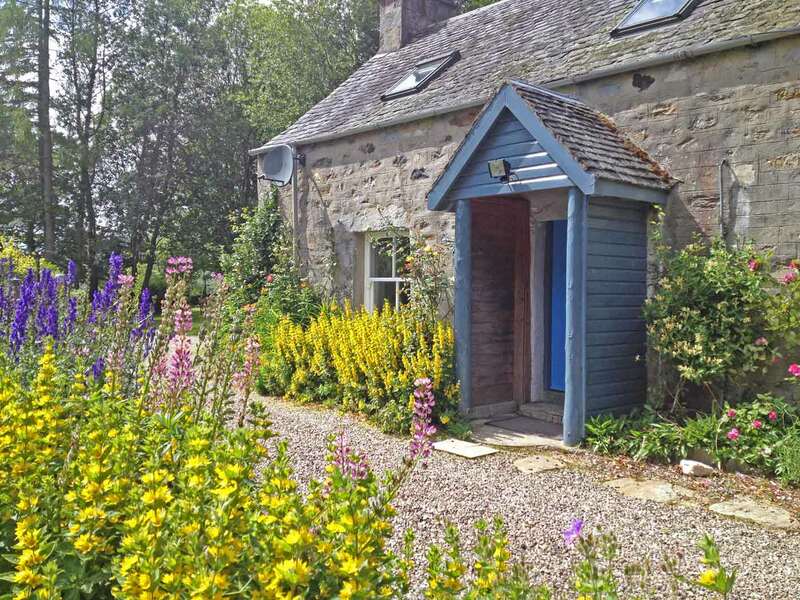 Standing in a peaceful spot with wonderful views to the south and west, this charming holiday home has a enclosed cottage garden filled with roses, mature trees and shrubs and lawn and is a mass of flowers in spring and summer. It is perfect for families or a cosy getaway for a couple. 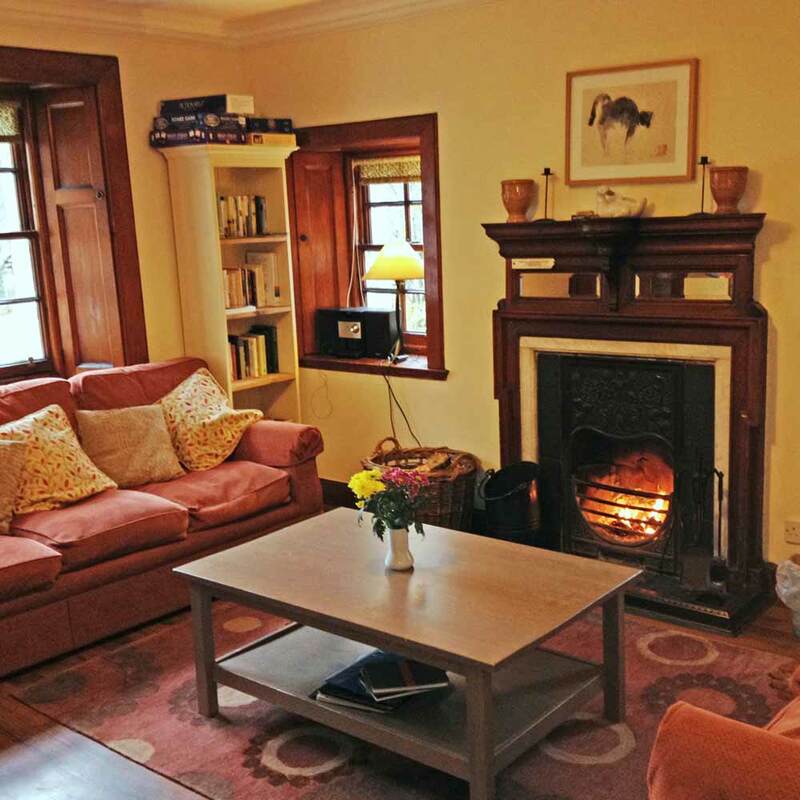 On the ground floor, the sitting room has a wood burning stove, sofas and easy chair, table lamps, TV and plenty of books and puzzles, and wifi. The window looks south to Schiehallion. 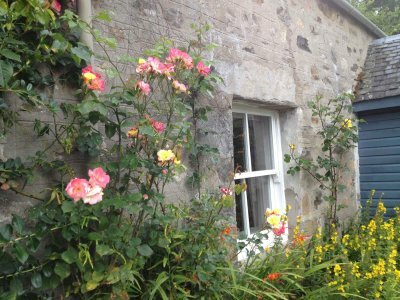 The kitchen is fully equipped and, in addition to the electric cooker, an oil-fired Rayburn cooker makes the cottage very warm, especially for breaks in winter, spring and autumn. There is a dining table and chairs in the window from where you can watch the birds on the feeder. The bathroom has new bath with shower over, basin and WC. 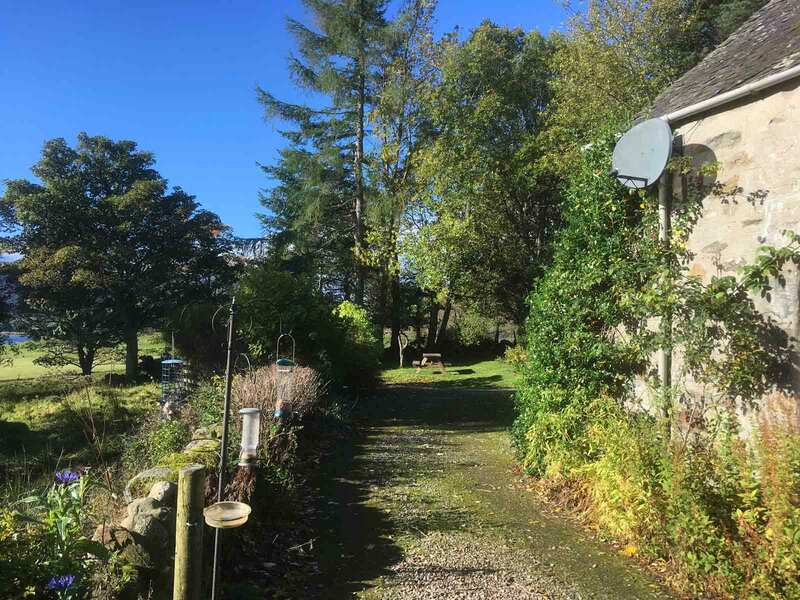 Upstairs, the double bedroom has a kingsize bed and a window overlooking the garden facing west and a large velux looking towards Schiehallion. 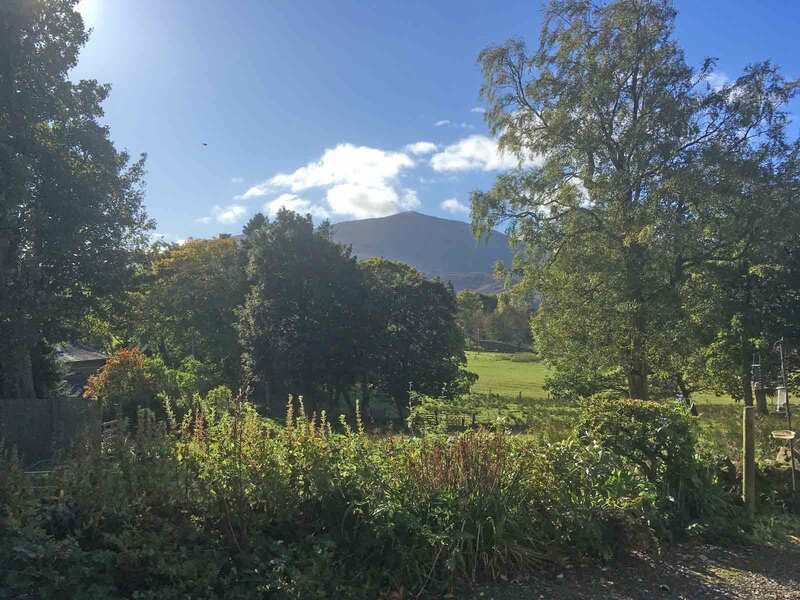 The twin bedroom has two single beds and a window facing east looking over the garden and a large velux looking towards Schiehallion. The single bedroom has a large velux window giving a view of Schiehallion. Heating is by oil-fired Rayburn, storage and panel heaters and wood stove. Electricity and oil included in the rent. Roses and honeysuckle climb the walls and daffodils are in abundance in spring. You can take lovely walks through the birch woods and along a track behind the cottage to a pretty burn or directly to the hills beyond. 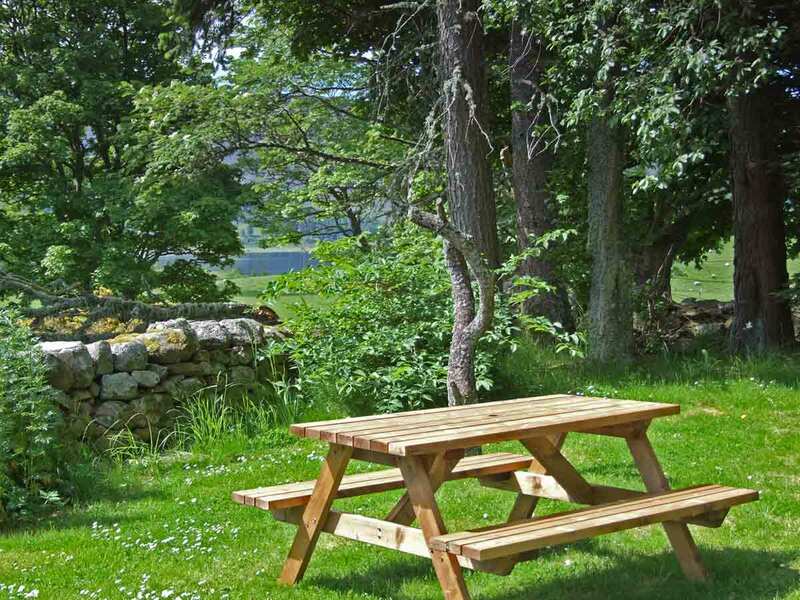 You can also walk down to Dunalastair Loch from the house, a 15 minute stroll. All kinds of interesting and rare wild birds and animals can be seen in the surrounding area. There is off-road parking adjacent to the cottage. Our luing cattle can sometimes be seen in the fields near the cottage but mostly live in our rougher pastures. They are attractive animals seen in the landscape together with the traditional Blackface sheep. Our Home Farm is nearby where traditional farm work goes on from time to time. “We were looking for a retreat after a hard couple of weeks…and this proved to be the perfect remedy. Beautiful property allowed us to rest ourselves physically and emotionally. Lovely time reading, playing cards and listening to music by the fire. We really felt a million miles away which was just what we needed. Lovely walks around the estate too in this magical place. Thanks for sharing this with us.” Guests from Victoria, BC. Canada from the Visitors Book Dec 2018. Quaint Rayburn cooker at Rose Cottage. There is an electric cooker as well!